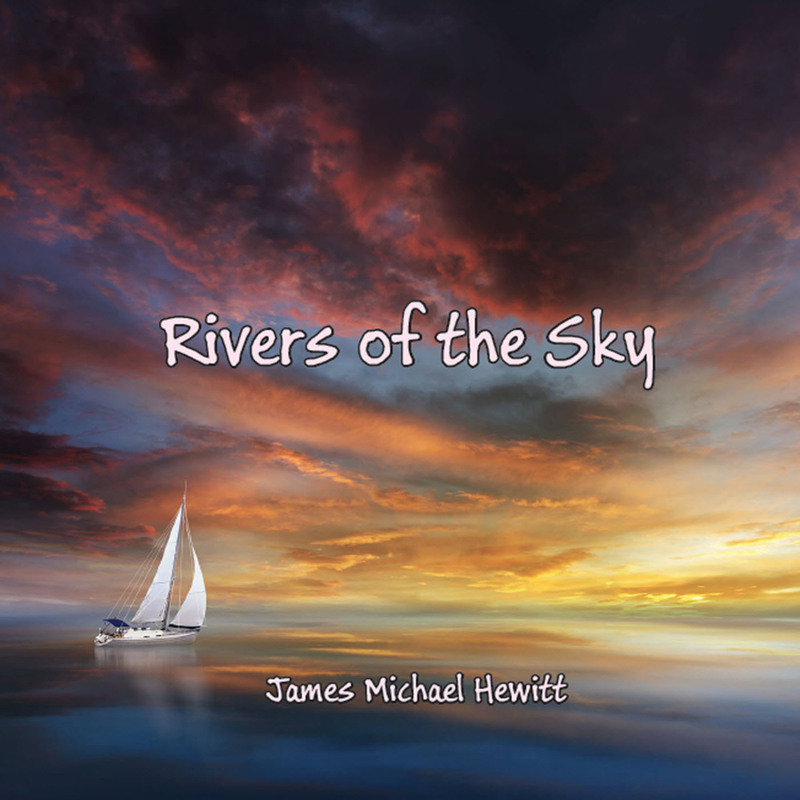 I have a new CD project, Rivers of the Land, that is not quite ready for duplication, but I have put up a couple of track samples below, One-Eyed Riverboat Gambler and River of the Ibis. 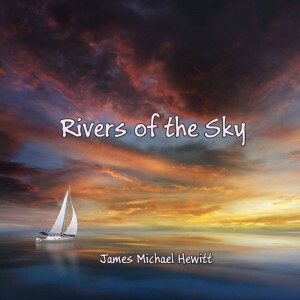 This 8 month effort incorporates a mix of electronica and acoustic music for meditation, relaxation, and just plain enjoyment. 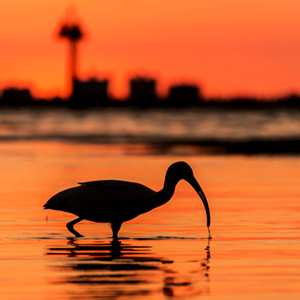 Imagine yourself on a river cruise in the jungles of Central America, taking a ride on the Ibis steamer, while the sounds of the river life stream past. Its about imagination, feeling, taking a trip in your mind to other places and times. At least that is how I approach these tunes. I hope you will take the time to enjoy them. The CD should be available for purchase on CD Baby after the first of the year, in 2019, in the meantime take a listen and look out for that bird cry near the end of Ibis. Its an actual field recording. More on that later. 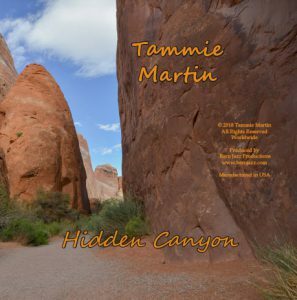 Just completed a new CD for Grand Junction singer/songwriter Tammie Martin, titled Hidden Canyon (samples below). 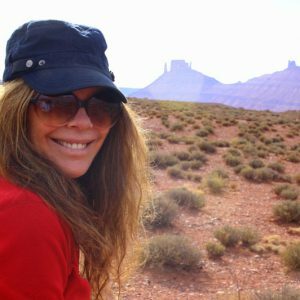 Tammie’s original songs are evocative of the mysterious expanses and loneliness of the red canyon country around Moab and points east and west. Her vocal style transports me to the backwoods of Kentucky or West Virginia, delivered fresh and uninhibited, while the live in the studio instrumentation is strictly down home, laid back bluegrass. 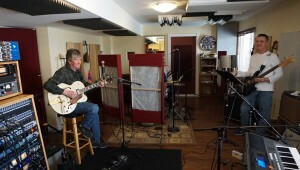 The songs are backed up by local players Bob Eakle (mandolin and dobro), Lisa Eakle (banjo), with Jessica Cooper on violin, and yours truly adding some overdubs on fiddle, viola, mandola, harmonica, and electric bass. 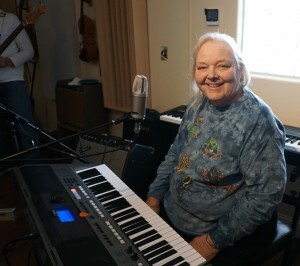 The basic tracks were recorded by live sound engineer, Chris Bollman, at the unique public recording studio located in the Mesa County Public Library in Junction. 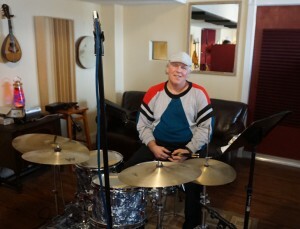 I was pleased to be able to mix and master the tracks and produce the final CD. Hidden Canyon is available directly from Tammie, but if you are unable to catch her performances in the area, you can contact Barn Jazz and we can arrange for you to get a copy. 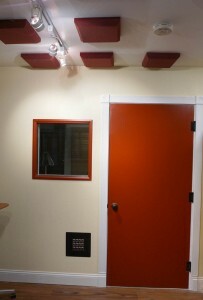 Our new studio in Littleton, CO is up and running and ready for recording projects, mixing, and demo mastering. More to come. Just in time for the holidays, my latest CD project, Barn Jazz Vol. 3, “High Fiddility”, is now available for purchase on CD Baby. You can buy individual tunes or the entire album, as well as audition clips of each of the tracks. This collection of original fiddle tunes and songs completes the Barn Jazz trilogy, which began back in 2001 in my original Oracle, Arizona studio. Given the recent political seismic shift, think of this as a metaphorical “high” to help put it all aside while we endure the next 4 years. 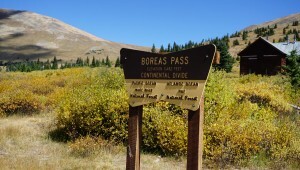 The photos were taken at over 11,000 feet at Boreas Pass, near Breckinridge, Colorado. I believe music, particularly instrumental music, should be all about imagery and imagination. High Fiddility is a collection of mostly original instrumental tunes and a few quirky songs guaranteed to take you into the highlands of your imagination. This is the third in the “Barn Jazz” series of albums, beginning with Barn Jazz Vol. 1, in 2003, Barn Jazz Vol. 2, The Night of the Dancing Vegetables in 2012, and finally Vol. 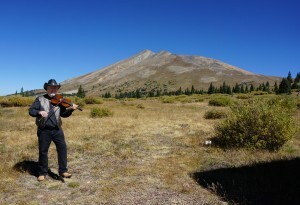 3, High Fiddility. “Barn Jazz” is my term for bluegrass in a tuxedo, or jazz in hip boots played at night when the cows have gone to bed. 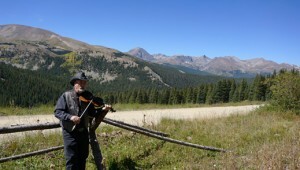 In essence this music knows no firm boundaries, has no walls, and requires only that you listen again and again for the details, for the sounds of the crossing the high country, or marching along the Grand Valley canals of Grand Junction. You may remember lost friends like Banjo Joe, and others who are no longer with you, while you wonder where they have gone. Maybe you had a first waltz, when you awkwardly held that young lady or gentleman, or shuffled off to the stars in sidereal time. Please enjoy this music when you work, when you play or travel, or when the lights are down low and the music is turned up. Please let me know what you think, I am always curious to find out if any of these tunes touch you in certain ways. Barn Jazz has relocated to Littleton, Colorado. The wonderful studio space in Grand Junction has been decommissioned, while we are seeking better economic opportunities in the greater Denver area. 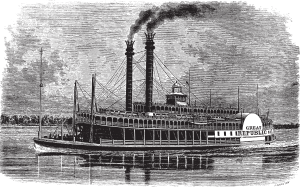 I am no longer accepting recording work for the near future, as I will be undertaking an intensive 5 month course in cybersecurity, beginning in mid-January. I will, however, be setting up a small composing and mixing studio in our new domicile, and will continue to accept small projects for mixing and post. I would like to extend a heartfelt thanks to all of those wonderful musicians in the GJ area with whom I have had the privilege to work. After about 2 months work by myself and 2 local, talented workers, the isolation room is now finished. The area will serve as a drum room, vocal booth for voice-overs and singer-song writers, isolation for electric guitar cab recordings, etc. The 9′ x 9′ x 8′ high room is (according to the experts) probably the worst shape you can have acoustically speaking (a cube), but with some good treatment from GIK and ATS, the sound inside is what I would describe as “neutral” for vocal and instrument work. It is not overly dead, nor is it reverberant. Hopefully it will sound good as a drum room as well. 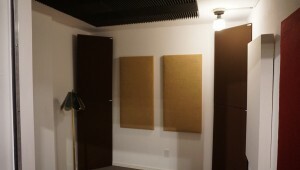 The acoustic treatment consists of four GIK tri-traps (bass traps) in the back corners, four ATS 2″ rigid rock wool panels, 2′ x 4′, on the back and side walls, and an additional GIK 2′ x 4′ x 2″ panel (white) on the right side wall. The ceiling has a 5′ x 5′ cloud of 1′ Auralex foam wedges, fastened using 2 tubes of Auralex adhesive. The area was originally a corner alcove that was open on one side. The left and rear interior walls back up to the house stem walls (as this is in a walkout basement), and the right wall is adjacent to the bathroom. 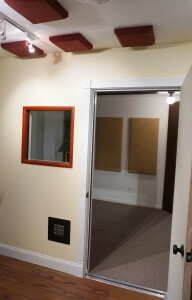 We added a layer of 5/8″ Soundbreak board over the existing drywall to all three walls and the ceiling, using RC-1 resilient channel and soundproofing foam tape from SoundProofingSale.com to provide a buffer and air gap between the new and existing drywall. 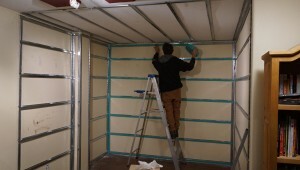 A new front wall was constructed for the window, door, and patch panel, using wood frame and Soundbreak on both the interior and exterior of the frame, with sound proofing foam tape between the drywall and wood. We used 2″ rock wool fiberglass from Home Depot for insulation. 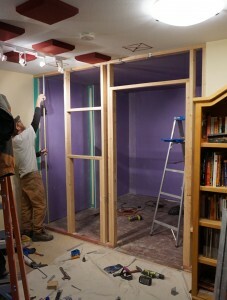 Mike Miller constructed the wall and put up the drywall. Soundbreak is very heavy gypsum board that is used as a replacement for standard drywall for sound studios, apartments, etc. It weighs about 86 lbs. per sheet, and is quite expensive ($70.00). It has an excellent STC (Sound Transmission Class) rating of 53 – 60 when installed over both sides of a wood frame. We obtained this material, along with oodles of sound-proofing caulk, from a local Grand Junction vendor, Pioneer Materials. The floor is simple utility carpet and pad from Home Depot, over vinyl and concrete. The window consists of two panes of laminated glass, one 1/4″, and one 3/8″, set into a shallow V-shape, with about a 3/4″ to 1″ air gap between them. 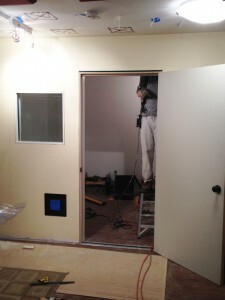 We used Rod Gervais’ book, “Home Recording Studio – Build It Like The Pros” for guidance on door and window construction. The door itself is a very heavy solid core, 1 and 3/4″ thick, from Home Depot, with a door seal kit and threshold drop seal from Acoustical Solutions. Ron Standing made the window, built the door jamb, and installed the door and sealing kit. Because of the precise specifications needed for sound attenuation, this was a lengthy process covering several weeks.When the door is closed, the drop seal falls into place to seal the threshold and door bottom so that sound cannot leak under the door. The door jamb has rubber seal material attached to an aluminum backing. You know its pretty air tight when you close the door because you can hear the air squeezing out. It takes a bit of effort to close the door, which is good. The patch panel is a through-the-wall set of jacks for 8 XLR microphone input/outputs and 4 TRS line input/outputs mounted in a black metal panel. I obtained the custom built and labeled panels from Redco.com, and then made a wood mounting box. I soldered up each side of the panel to their respective jacks, requiring 72 connections. I am really glad I had the proper tools for this (hint: resistance soldering station).The edges of the box were sealed with acoustic caulk, and the box interior stuffed with rock wool fiberglass insulation. Ron had special metal trim plates made locally for both sides of the box, to help hold it in place and provide a nice border. He then cut a hole next to the door and attached the box to a stud, and sealed the edges. The total cost of construction was about $7200, with $4470 for materials and $2730 for labor, spread out over 2 primary work men (Mike Miller and Ron Standing), as well as two assistants and a carpet person. In addition to being the general contractor, I built the patch panel and did all of the painting (the easy stuff!). Given that a similar-sized pre-fab isolation booth from WhisperRoom.com can cost from $10,000 to $20,000 plus shipping, this is a pretty good cost savings. The only thing missing is ventilation. 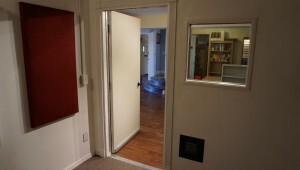 Smaller booths require this, but given that the talent will be recording for short durations for the most part, the door does not have to remain closed for more than 15 or 20 minutes. Adding a vent system similar to that found in the DawBox.com design still may happen, but I did not want to risk compromising the sound isolation unless absolutely necessary. The iso-room will help cut down on street and aircraft noise, which occasionally is an issue here. There is no such thing as “sound-proofing”, but with the ability to attenuate sudden rumbles or loud jet noises will improve our recordings and cut down on re-takes. Next up, I will be doing some SPL measurements inside and outside of the booth to chart just how well we are doing at sound attenuation. 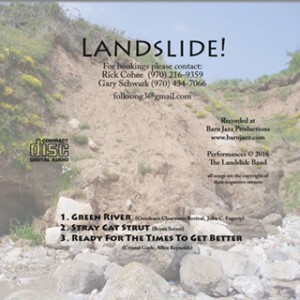 We just finished a short 3-song project for the local Grand Junction band, Landslide, with Rick Cohee on electric guitar, Gary Schwark on drums, Theresa De Rush on keys, and Craig Kovalcik on bass. This is a great example of a cover band doing it “live in the studio” for demo CD, something to give out to venue owners and booking agents. 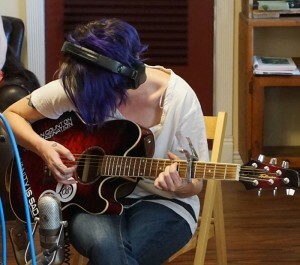 This very affordable project took only 8 hours to complete from recording setup to finished master. The final product was manufactured in house, with a full color printed CD in a clear plastic jewel case. Ready to rock a landslide!